Since I have some whole wheat flour on hand I decided I wanted to try to make some good use of it and have been looking around for some recipes to try beyond just making some wheat bread or even a wheat bread crust pizza. Both would be fine, but I wanted something a little different. Then I remembered just how much Sean has always liked the bread that you get when you go to Outback for dinner. They serve these little dark loaves of bread that are warm and tasty to go along with your meal and I figured that they had to use some type of wheat flour in them, so I went searching on the Internet and came across a number of recipes that offer different ways of making a copycat of just that bread. I pulled a few together and tweaked them slightly to fit what I thought would work and the results were pretty good. Measure the warm water into a 2-cup measuring cup. Add the sugar and the yeast and stir the mixture until the sugar and yeast dissolve. Let the yeast mixture proof for 5 minutes until it begins to bubble. Mix the bread flour, wheat flour, cocoa powder, coffee granules and the salt together in a large bowl with a whisk. Using your fingers, incorporate the softened butter into the flour mixture until it is well blended. Make a well in the center of the dry flour mixture and add the honey, molasses and the yeast mixture. Stirring from the middle, bring the dry ingredients gradually into the wet ingredients. You can start mixing with a spoon or spatula, but at some point you are better off doing this with your hands to bring the dough together nicely. Turn the rough dough out onto a lightly floured work surface. Knead the dough for about 10 minutes, adding small amounts of flour to the kneading surface only if needed. Let the dough rest for a few minutes while you wash and dry the bowl you were originally mixing everything in. Spray the inside of the bowl with cooking spray and place the dough into the bowl top side down and then turn it over so that the top is lightly coated with some of the cooking spray. Cover the bowl with plastic wrap and place the bowl in a warm, dry spot to rise. Let the dough rise for 1 to 1 1/2 hours until it has doubled in size. When the dough has doubled in size, cut it into 6 portions. Form each portion into a 6-inch log or any other shape that you would like the bread to be in. Pour a small amount of cornmeal onto your work surface, moisten each dough portion lightly by wetting your hands with water, removing most of the water and rubbing your hands over the dough. Roll the lightly moistened loaves in the cornmeal to coat the loaves. Gently pat each loaf to remove any excess cornmeal. Place the loaves on a lightly oiled baking sheet and cover them with plastic wrap and set them aside to rise for another 1 hour or until they have doubled in size. Preheat the oven to 350 degrees. Uncover the loaves of dough and place them in the oven to bake for 35 to 40 minutes. Remove the bread from the oven and allow the loaves to cool for 10 to 15 minutes before serving. Just a couple of things about this recipe. As far as taste, these loaves taste great and very much like the ones that you will get at Outback or other steakhouses. However, they are not going to be the same dark color that you get from the loaves at Outback. If you want that really dark brown color, all of the recipes I came across said you can add food coloring to achieve it, but to me it just isn’t worth it only so you can get that look. I can live with the lighter brown color instead of the dark, but if you want it combine 1 1/4 teaspoons of red food coloring with 1 teaspoon each of yellow and blue food coloring and stir it into the water when you are adding the yeast and you can get the dark brown. 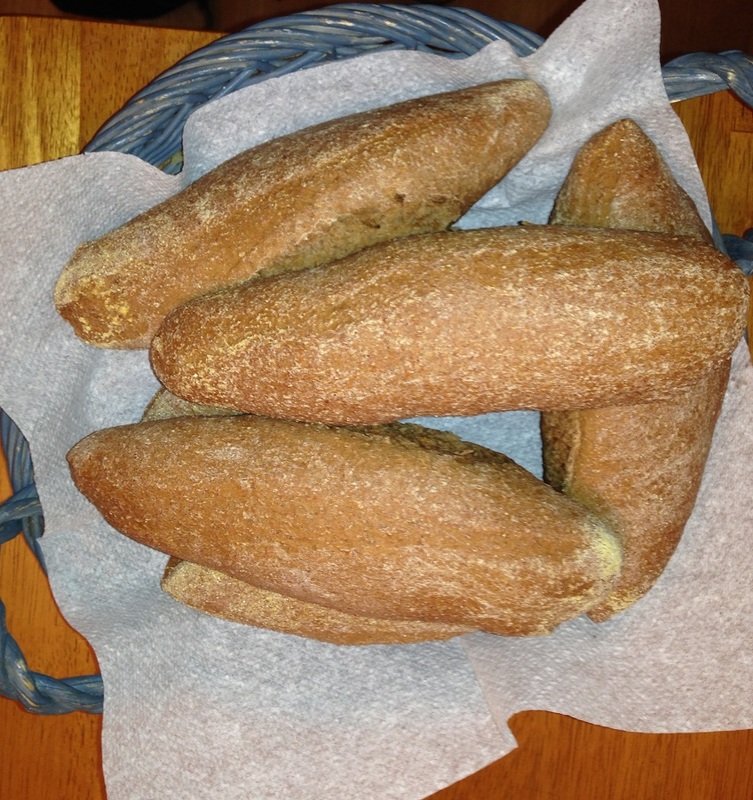 In any case, the taste was great and you can get a few mini loaves out of one recipe. I made the six loaves and froze a bunch of them just so we can have one to pull out of the freezer and bake when we feel like having one with our meal. It’s an easy recipe you can do once a week and then have bread any time you would like it without having to go out for dinner for it. Nothing like the smell of bread baking to get the appetite going. You said it! We love homemade bread with a meal. Thanks for the comment!